Though these breasts are great served hot off the grill, they’re also fine served cold in the coming days, either plain or sliced atop a salad. Combine 1-1/4 cups of the cilantro with the coconut milk, lemongrass, basil, chiles, garlic, salt, brown sugar, pepper, and coriander in a food processor or blender and purée until smooth. Arrange the chicken breasts in a nonreactive baking dish or other vessel large enough to accommodate them in a snug single layer. Pour the marinade over the breasts and turn to coat them well. Cover and refrigerate for at least 2 hours and up to 1 day. Heat a gas grill to medium high or prepare a medium-hot charcoal fire. Grill the chicken (covered on a gas grill) until it has good grill marks on the first side, 4 to 5 minutes. Flip the chicken (cover a gas grill) and continue to cook until firm to the touch and completely cooked through (check by making a slice into one of the thicker breasts), 5 to 6 more minutes. Transfer to a platter and let rest for 5 minutes. 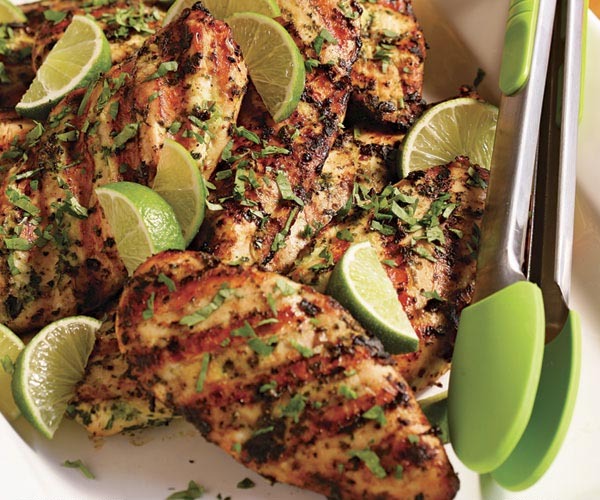 Sprinkle with the remaining 1/4 cup cilantro and serve with the lime wedges. Note: Before chopping the lemongrass, be sure to cut off the spiky green top and enough of the bottom to eliminate the woody core. Peel off a few of the outer layers until you’re left with just the tender heart of the stalk.